Canon U.S.A ,today announce the RadPRO1 Mobile 40kW Flex Digital X-ray System, an x-ray system that incorporates a new telescopic tube column helping radiographic technologists to maximize their lines of vision for safe transport when moving around a healthcare facility. Designed to provide an effective mobile digital radiography solution for hospitals, clinics, and universities, the RadPRO Mobile 40kW Flex Digital X-ray System enables improved visibility, as compared to the current 40kW System. Compatible with the Canon CXDI- 70C, 80C, 701C, 801C and 401C wireless digital flat panel detectors, its fast processing times make it easy to capture high-quality diagnostic images for routine diagnosis or challenging trauma, with flexibility in patient positioning and the ability to manage or manipulate images at bedside. The new functionality builds on the ease of maneuvering and positioning that is a hallmark of the current RadPRO Mobile 40kW System, while maintaining the ability to capture high-quality diagnostic images for routine diagnosis or challenging trauma directly from a patients’ bed. Additionally, with a blend of mobility and power-saving advantages, the RadPRO Mobile 40kW Flex Digital X-ray System’s new counter-balanced telescopic column provides user-friendly positioning without draining battery power. The new lead crystal batteries have a long battery life, therefore eliminating the need to recharge frequently. The dual battery configuration also allows for distributed power to the drive motors as well as to the generator. 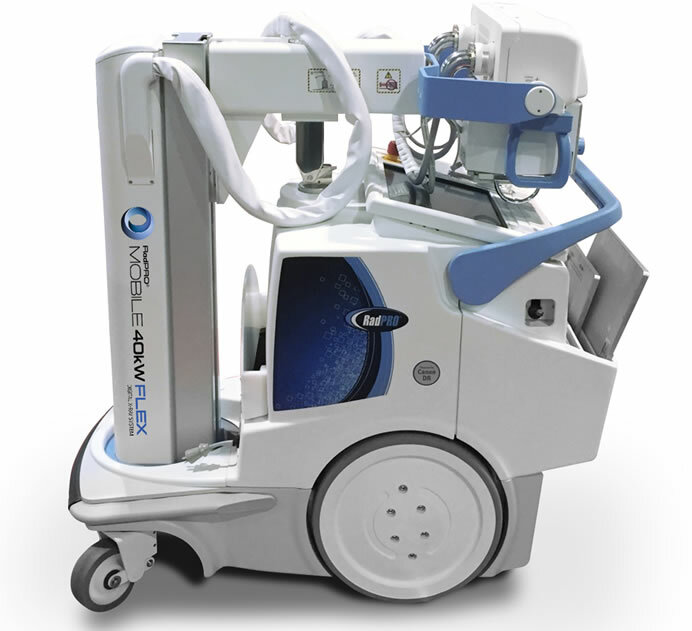 The RadPRO Mobile 40kW Flex Digital X-ray System is sold by Virtual Imaging, Inc., a Canon U.S.A. Company, and its authorized dealers.